Bone scans are used by the imaging experts at Optima Diagnostic Imaging to determine the health of skeletal structures. We use the new generation, state-of-the-art PET/CT technology with Sodium Fluoride to obtain fused PET and CT images of the bones. 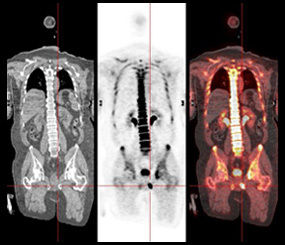 NaF-18 bone scan is a new technology that has been found to be highly sensitive and accurate in detecting abnormalities and is available at our private Los Angeles facility. Using PET technology and the 18F Sodium Fluoride radioisotope, we can now image the skeletal system (bones) in a much more sensitive and efficient manner than with traditional SPECT (single photon emitting computed tomography). Therefore, we can detect metastatic bone disease at much earlier stages and can help differentiate benign from malignant bone lesions. Sodium Fluoride bone scans are a valuable tool in critical treatment decisions and are commonly used to stage many types of cancers and to evaluate responses to medications, chemotherapy, and radiation therapy. By identifying and attacking the spread of cancer to bones much earlier, we increase the chances of eliminating the disease. Bone scans are a short painless procedure. Patients are positioned on a table while the images are taken. Bone Scanning at Optima Diagnostic Imaging has been awarded accreditation after a comprehensive review performed by the American College of Radiology (ACR). This certification confirms that our center meets rigorous standards for practice in Bone Scans.